In the middle of the night something very strange woke me up. I first thought I was dreaming...but no. It was a little voice. 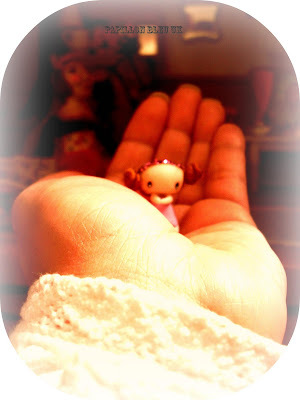 ...I discovered a little fairy!!! 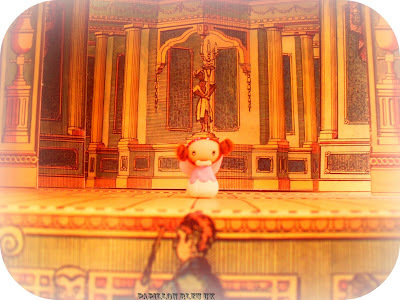 And she was playing in the little theatre from the doll's house. 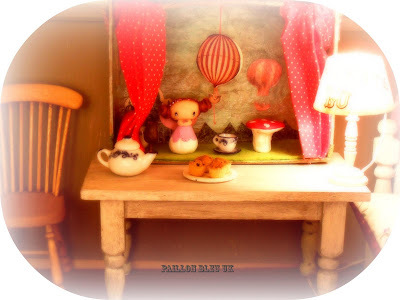 I recognised the song she was humming: "tea for two...hmm, hmm"
"Hello Papillon Bleu! 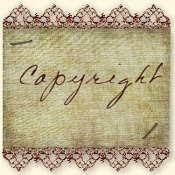 I was sent to you because I have got something for you!" She was soooo cute and lovely . 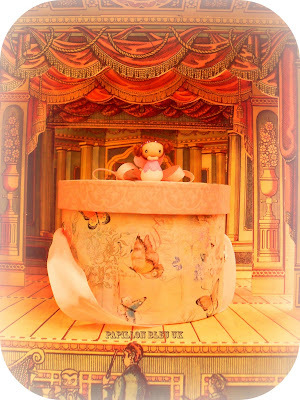 She added: " I am going to make some magic before your very eyes...1...2...3..."
A lovely box appeared under the fairy. "This is for you" she said. So I opened the box and discovered one of the sweetest dolls ever. "I have come to you because you have sent one of your favourite dolls to a loving home.Anaïs is fine.She is happy and making lots of new friends. Her new mom, Alicia, sent me to you because she thought I'd make you happy too!" said the beautiful doll. Oh how I loved her as soon as I saw her! We giggled and danced together. 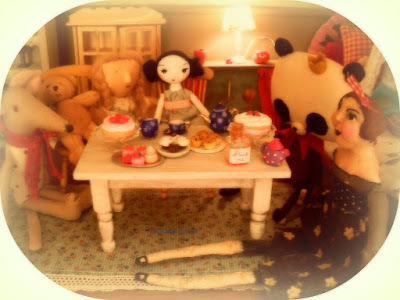 Then , our mini tea room owner set the table with delicious cakes and the finest tea. We asked the doll what her name was. She replied in a very soft voice. 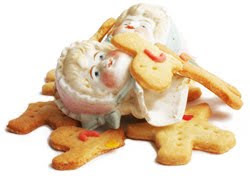 And little by little, the dolls of the house gathered around her. That her name was Alice. 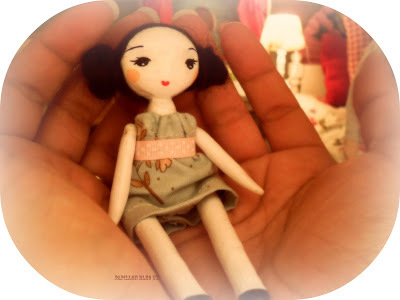 And this is how I would like to introduce you to this beautiful little doll that I have swapped with a very talented mini doll creator ALICIA whose blog is FAUSTINE & COQUELICOT. This is the person to whom I have sent my little Anaïs. She has also created the lovely little fairy with butterfly wings. And speaking of joy, I know a little girl who has received a parcel that I sent not so long ago.Click here to see who it is if you are nosy like me! Keep on dreaming mes amis! Ohhhh, another lovely story Patricia. I've just read it to Liberty and when I got to the part about the fairy talking to you she said, "for real?"! Liberty also thinks the little tea party is very 'cool'. 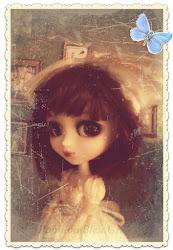 Alice is a gorgeous doll, so pretty, there are so many talented people out there in the world. Thank you for all the joy you have brought to our house this week! non je rigole, elle est super mignonne ton histoire, j'adore !!! Wouah, ravie de voir qu'Alice et la petite fée se sont bien instrallées, j'adorerais venir jouer à la poupée avec toi! :) Peut-être lors de mon prochain passage en Angleterre? Bisous et à bientôt!!! Beautiful post and a beautiful swap. Alice and a little fairy are amazing! 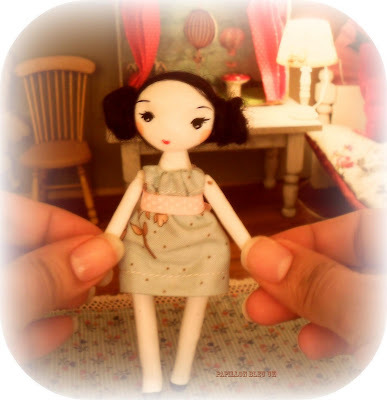 Your fairy it´s wonderful.I love your dolls. Hugs Matilde. C'est une si jolie histoire, et de si belles photos. Cela me fait rêver, le genre d'histoires qui me dit que si la vie avance je suis encore une petite fille (pour certaines choses). Je suis contente de voir que je ne suis pas la seule. La poupée est superbe, et la petite fée aussi. Another awesome tale, oh how I loved reading this. Thanks for sharing. Adorable !!! Les poupées sont magnifiques et ce goûter aussi! La grande jeune fille à gauche de Monsieur Panda est très très jolie également! Alice is so sweet! Ahhhhh, how lucky you are to have fairies visit you. They must be attracted to all the magic :) Have a magical day Patricia!! 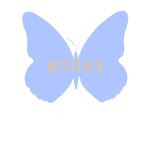 Beautifull and soft blog! Flying kisses for you. j'ai pas le temps de lire là mais je vais revenir, ça m'a l'air encore somptueux ct'affaire! je suis déconfussionnée, troulouloutée si je t'ai un tant soit peu emp^echée d edormir, je disais ça riejn que pour rire, c'était du 72° degré. 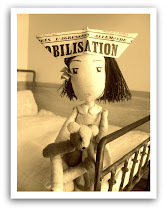 Toutes mes zexcuses, j'le frai plus! Biz, et rassure-toi, y a pas dlézard. Bon je m'en vas bosser beurk beurk. 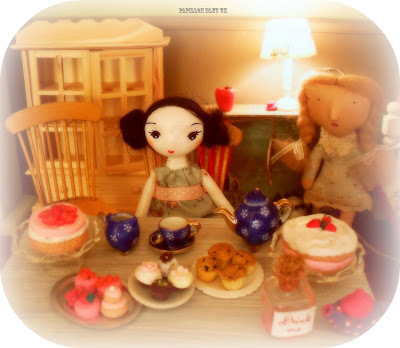 What a fantastic post~I love the tea party and both your doll and Alicia's are adorable! Thank you so much Patricia. You've made my evening. You know how much I enjoy reading your blog. 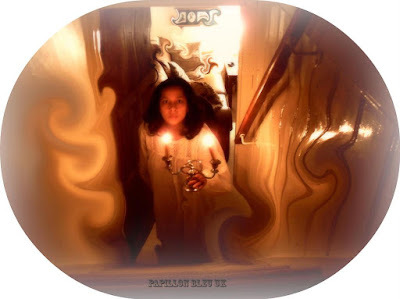 Your blog truly is magical and mesmerizing. I have no doubt that some of my readers will come by and be enchanted. You drew me in with this great tale of a very sweet little 'fairy'! So adorable! Her name, Miette. Well, we love the French language, and when I realized Miette could either mean little pearl or little crumb depending on the translation, we couldn't resist naming her this. And it fits her perfectly!